It is almost Easter, temperatures are rising and after a long, cold winter many consumers are heading to the city centers to go shopping. However, the joys of splashing the cash could soon be slightly dampened, because prices for consumers are rising as steadily as the mercury in the thermometer at present. In March, the consumer price index compiled by the Federal Statistical Office was 2.1% higher than in the same month of the prior year. Not since October 2008 have stronger increases of 2.4% been recorded for prices of consumer goods. The principal driver was once again energy prices, which shot up by 10.5% in just one year. Consumers had to pay over 30% more for light heating oil and 11% more for petrol and diesel. The price of electricity increased by 7.6%, while natural gas providers also charged 3.6% more. According to an article in the daily newspaper “Die Welt”, which was published shortly after the latest figures were released, in many industries this inflation is in fact engulfing salary increases. 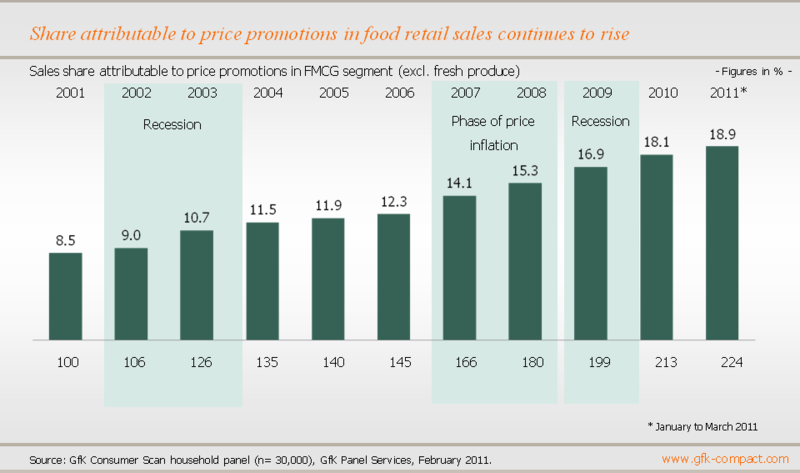 In general, food price rises were not so severe, at 2.2%. However, increases in the prices of specific purchases, such as 28% for butter and almost 10% for fruit, are likely to have a significant impact on the consumer purse. The price increases have not escaped the notice of German consumers, with price expectations increasing to 0.2 points in March, which is 4.3 points higher than in the prior month and stands more than 35 points above the previous year’s level. These are the latest figures from GfK Marktforschung (GfK Consumer Climate MAXX). What lies behind the price rise spiral? The economic crisis has been overcome, consumers have a little more money to spend and, partly on account of this increasing demand, prices have been driven upwards. In addition, Germans have had to dig a little deeper in their pockets when making purchases as a result of expensive raw materials and recent events such as the dioxin scare, which caused many consumers to move away from discount stores to organic produce. Many consumers do not anticipate an end to this trend and price expectations for the future are currently only pointing in one direction: upwards. In March of this year, the indicator was almost seven points above the prior month’s value, and in comparison with March 2010, price expectations increased by as much as 30 points. 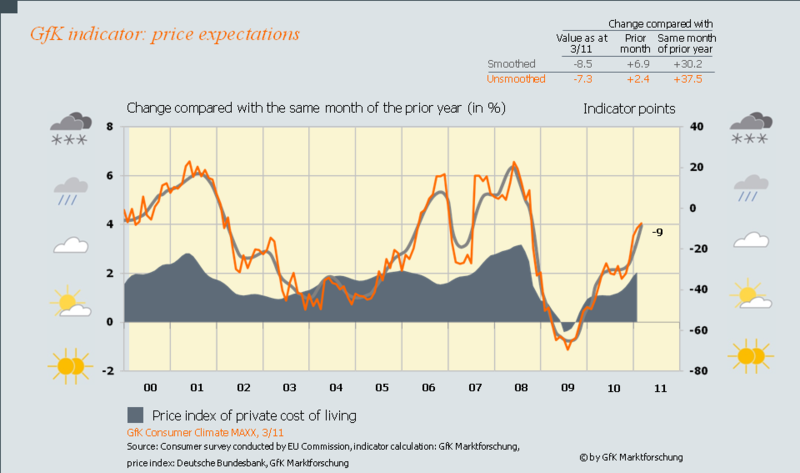 Germans are probably not entirely mistaken in their perception that life will become more expensive in the coming months. The prices of the raw materials required for many products are increasingly being pushed upwards as a consequence of rising demand and higher transportation costs. (Source: Consumer Index). 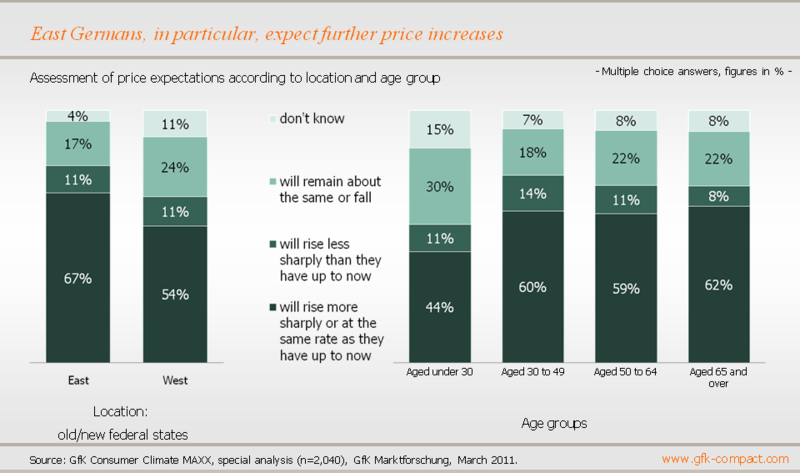 Concern about rising prices differs depending on the age and location of consumers. East Germans in particular fear that the peak is yet to be reached for consumer prices, with two in three anticipating that the price hikes will continue at the same rate or even become more rapid. A further 11% of respondents in the new federal states are hoping for slightly weaker rates of increase. 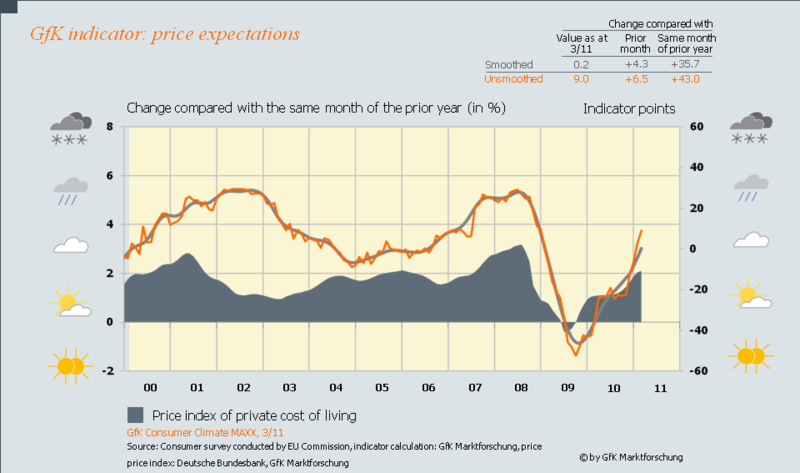 Consequently, almost 80% of all East Germans in total assume prices will continue to rise in future. In Western Germany this figure is significantly lower, with only 65% expressing this view. Differences in expectations between age groups are relatively marginal when comparing consumers over the age of 30. It also does not make a difference whether respondents are retired or working, or have a lower or higher standard of living. Youthful optimism is the only attribute that stands out, with confidence more prevalent among young Germans under the age of 30, and in particular among adolescents and students. Almost one in three assume that the cost of life will remain the same or fall, which is only the case for around 20% of consumers over the age of 30. Overall, the majority of the German population expects the strain on their finances to increase significantly. However, it is possible for consumers to make their money go further at the moment if they are willing to seek out bargains. Both manufacturers and retailers have expanded their price promotional activities, offering specific products at lower prices for a limited time. At the start of the year, offers in the area of fast moving consumer goods (excluding fresh produce) generated one fifth of sales and if only manufacturers’ brands are taken into account, the sales share of price promotions comprised a quarter. (Source: Consumer Index). It is therefore apparent that, in light of rising prices, food retailers are increasingly trying to attract customers into their shops by offering discounts. Nevertheless, Easter baskets can still be filled this year without putting too much of a strain on the family purse because, in a year-on-year comparison, confectionery has actually become less expensive. (Source: press release from the Federal Statistical Office published April 12, 2011: consumer prices March 2011). It is quite likely that anyone who already started shopping for presents before Easter will have found the odd bargain or two. For enquiries please contact Rolf Buerkl, email: rolf.buerkl@gfk.com resp. Claudia Gaspar, email:claudia.gaspar@gfk-verein.org.